A warm welcome to all of you who share a deep love of animals and a desire to help your fellow animal lovers heal from loss, and are interested in professional training for pet loss grief counselors. For those of us who view our animals as family, we understand that losing them can be an emotionally devastating experience. Our grief at these times deserves to be honored with acknowledgment of the legitimacy and depth of the relationship, the legitimacy and depth of the loss, and to be supported with love, tender compassion and effective empathic skill. Everyone who experiences the loss of a deeply beloved animal deserves the same compassionate support and competent, professional help that is typically available to people who lose human loved ones. 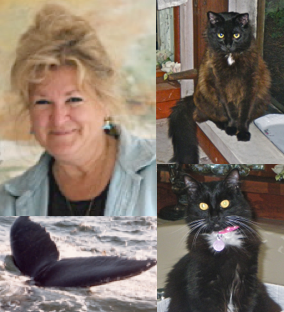 I’ve been working with clients in workshops and in counseling since 1986 to help them heal from pet loss. Thankfully, acknowledgement of this loss as a legitimate reason to grieve has shifted greatly, evidenced by the dozens of books, web sites and other pet loss services and products created since that time. That being said, our cultural consciousness has a long way to go. In my private practice, I still hear from clients, as much as I did thirty years ago, about pain from a sense of isolation and doubts about whether it’s normal to love and mourn for an animal so deeply because of others’ negative comments and attitudes. Sadly, I also hear just as many stories about family members, friends, clergy, therapists and others who openly or subtly belittle the experience of pet loss. It seems that animal lovers have created services to help their other fellow animal lovers, but our culture at large still doesn’t get it. In the circles of those who love animals, we are supporting each other with more services and products to heal from pet loss, but outside those circles the grief from animal loss continues to be largely disenfranchised. The program is designed to be part of changing this picture by offering in-depth, professional training for pet loss grief counselors. The disciplines covered in the program classes include understanding the dynamics of grief and healing from grief, complicated grief, the disenfranchisement of animal loss, understanding trauma and post-trauma stress as it relates to loss and grief, animal hospice and euthanasia, practitioner compassion fatigue, counseling psychology and client-centered counseling skills, the role of spirituality in grief counseling, helping animals who grieve, ethics and energetic boundaries, and electives in the healing arts. The in-depth curriculum is based on bodies of knowledge and research from the fields listed above, integrated with the professional experience of the fifteen instructors who teach the classes in the program. For those of us who feel called to support others who have lost their animal loved ones, it is important that we openly embrace these concepts as true for many of those we will serve. This is a holistic program, meaning that it intentionally includes and integrates content about the psychological, spiritual and physical aspects of animal loss, grief and healing. Despite common stereotypes to the contrary, holistic does not mean new age, ungrounded, lacking substance, void of facts or reason, or antithetical to research, science, medicine or psychology. The Cambridge Dictionary defines holistic as “relating to the whole of something or to the total system instead of just to its parts.” For the purposes of this program for professional training for pet loss grief counselors, it means that the “whole” view of a person’s loss, grief and healing process—the psychological, physical and spiritual aspects of their needs and experiences—is acknowledged, honored and addressed in the various classes. Appropriate to a program on grief counseling, the majority of the classes—seven of the ten required classes and five of the ten electives—are psychology based. Three classes focus on physical issues—hospice, euthanasia and pain management—to ensure that graduates of the program have an adequate understanding of these issues that clients will experience and likely discuss. Five of the program classes focus on spiritual issues. The required class, The Role of Spirituality in the Helping Relationship, and the elective class, Animals’ Perspectives of Death, the Other Side and Coming Back directly address spirituality. Three additional electives tend to spirituality by covering healing arts tools to raise the awareness of methods clients may already be using and discuss, and, for students to learn how to use these tools if and when relevant to clients who may be interested in using them. This coverage of the psychological, physical and spiritual is by design so the graduates of the program are prepared to understand and support clients wherever they are in their process, with whichever aspects of their loss are in most need of support and healing or importance to them at a given time. In this holistically orientated program, we don’t shy away from talking about love as a key component of the helping relationship. One of the underlying philosophies of the program is that compassion and love are considered to be the foundation of effective grief support. Without love and compassion as a base, the most learned and sophisticated therapeutic techniques can seem cold and useless to those who suffer from grief and are seeking help to heal from pet loss. It is the integration of compassion and love, along with effective skill in counseling techniques, that brings great power to the helping relationship, a power that can move mountains of grief to greater peace. An ideal that has inspired me for many years is that the best education is about knowledge joined with love. This core value of my Franciscan alma mater, Alvernia University, has influenced my professional life for many years. Knowledge joined with love is a cornerstone of this certification program—the classes and mentoring offer not just knowledge, not just love, but knowledge with love. as much as you give. You’re likely to receive even more. If you are attracted to or are already on the path of helping others through the grief of pet loss, I invite you to explore the underlying philosophy and the code of ethics of this program to see if it seems like an appropriate learning fit for you. It may also be helpful to learn more about how the program came to be and why. More details about our professional training for pet loss counselors can be found in the sections on Certification Requirements, Class Listings and Frequently Asked Questions (FAQ). If you are not yet ready to enroll in the certification program, but want to “test out” what the classes are like, you are welcome to participate in any class, at any time. You need not enroll in the certification program to take individual classes. All classes are open enrollment–available to everyone. If after reading the details of the program on this site you feel ready to enroll, please complete the Application Questionnaire and email it to us. Once received, we’ll set up a phone appointment to talk about your needs and how the program may fit them. If you decide that this professional training for pet loss grief counselors is for you, I look forward to lovingly welcoming you into our community of students, graduates, instructors and ongoing support. If you have any questions or concern, feel free to contact us. 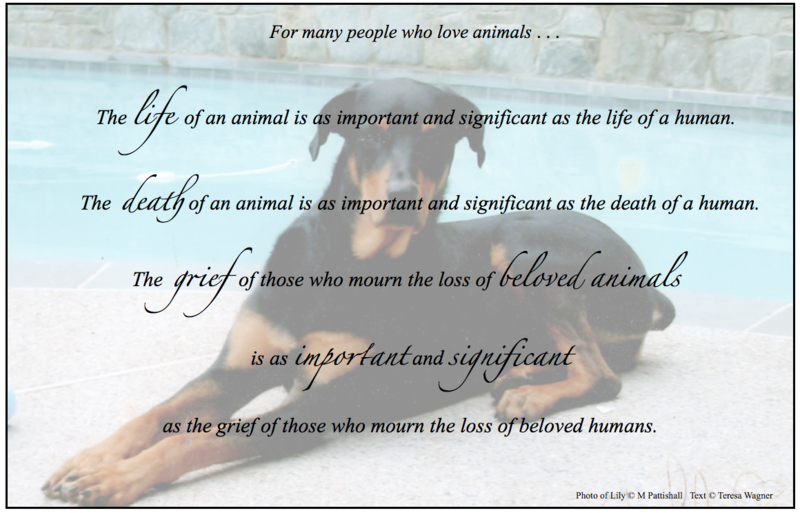 It is my greatest wish that the classes and related services of this certification program contribute to your inspiration, confidence, knowledge and skill in serving the people who are grieving the loss of their animal loved ones. They deserve and need our support! Clarification and Disclaimer: This professional training for pet loss grief counselors program does not prepare participants to conduct psychotherapy or long term counseling. It does provide comprehensive, in-depth training and education in client-centered counseling theory, skills and practice for use in short term counseling and grief support in the context of helping those who are mourning the loss of animals—in one-on-one consultations, pet loss support groups, veterinary settings or as a supplement to any of the healing arts.